This will be a small post in which we would make a bullet or a projectile which can be added to a game. Most of the games have some sort of ranged weapon or an enemy having ranged weapons throwing bullets, arrows etc. We would consider bullet to be a circular fixture so we would attach a circular fixture to the body. The above properties can be used to make a circular bullet. Arrows are little tricky. 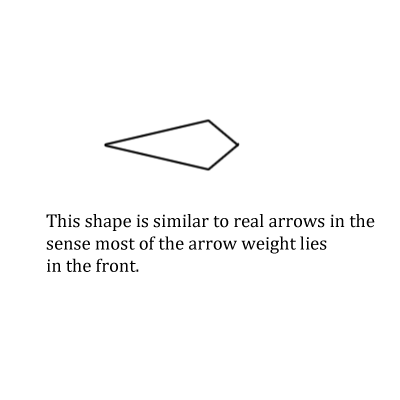 We tried to make arrow a polygon of the kind of shape shown below and added custom drag at its tail to simulate a real arrow. But most of the time they never landed on the ground vertically and would fall horizontal. So we skipped to a circle shape fixture as it looked better. Finally we set the rotation angle to the Texture in degrees to match the angle of the body’s velocity. Note: When we say body position we actually mean the position which has been scaled to world coordinates. Suppose we have an enemy and it is shooting bullets. So either we can have a array in enemy class to handle the bullets or have a global body manager as mentioned in the previous to handle the bullets. It can be useful if we keep references of bullets in enemy class but creating them in a global manager. In other case if an enemy dies and you destroy the object then the bullets which were created in the enemy object would also be destroyed but if the enemy class just has a reference from a global object manager then the bullets will still remain active till they hit the obstacle. For shooting/throwing a body the easiest way is to apply impulse. Its syntax is body.applyLinearImpulse(ImpulseX,ImpulseY,pX,pY) where ImpulseX and ImpulseY are impulses in x & y direction and px and py are the points where you would want to apply the impulse. Usually we put impulse at the center of the body so px would be body.getWorldCenter().x and py would be body.getWorldCenter().y as the arguments should be in world coordinates. getWorldCenter() gives the center of body in world coordinates. There is another function called applyLinearForce which can be used to apply a constant force to a body over a period of time. Impulse on the other hand is a fast acting force which causes instant change in velocity and does not depend on time. You can think of ApplyLinearForce in cases like applying gravity,wind drag etc and ApplyLinearImpulse in case like hitting a ball where force is short lived. 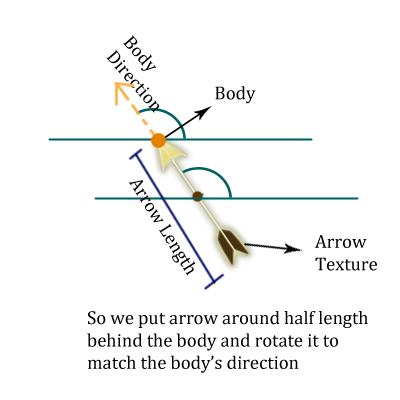 In the above case arrow’s body velocity can change really fast for e.g. an arrow shot vertically in air its y speed would change from positive to negative in a frame which can be a potentially a 180 degree change in a frame’s time. So that would give a really jerky look to the animation. In balloon shooter we added two variables, one to hold the current body angle and other to hold current texture angle. In updates we would slowly increment texture angle to reach the body angle value in fix steps rather than reaching the value in one frame. Thanks for the patience. If you have any queries/suggestion please put them in comments and we would try to answer them.